How to review this book? It’s the memoir of a woman living in poverty with her very young child, dependent on government assistance to survive — a woman who always wanted to be a writer and finally does earn a college degree in creative writing — a woman who, with this memoir, is now a published writer. To support herself and her child along the way — and to satisfy the prerequisite for receiving government aid — this single mother works as a maid. 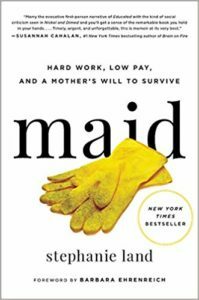 I wanted to feel some of that about Maid, but I struggled. By nature, I’m an optimist. I see the glass as half full. The author does not. For her, the glass is half empty. The studio apartment she rents for herself and her child has black mold. The clients who pay her to clean are gross. The caseworkers who see that she gets food stamps are insulting. Customers behind her in line at the supermarket are condescending. I’m not sure what I expected. But it wasn’t endless negativity. Despite the lengths to which the author went to describe her horrible life, I couldn’t feel sorry for her. She felt sorry enough for herself. Part of the problem for me was that I listened to the Audible version of this book, which the author herself read. So when I heard self-pity, I believed it. One last thought. I know women who clean homes. Yes, it’s a dirty job. And no, I wouldn’t want to do it. But the women I know who do it, like that they work mother’s hours, like that they make a mirror shine, like that they earn money. One more last thought. For the life of me, I can’t figure out why this author chose to keep working a job she so detested. It seemed to be one more bad choice in a life full of them (an issue she doesn’t explore). She worked as a maid earlier in her life, long before she was homeless, and knew what it entailed – not the least being that it often pays sub-minimum wage. And hey, I agree that even minimum wage is way too low. I regularly vote to raise it. But until that happens, I have to think that there are other jobs for minimum wage that this woman might like better. No? I feel like an unsympathetic curmudgeon posting this review. I will say that the writing of Maid is competent. Hence three stars, rather than two.